Made by Albion Hat and Cap Co in Alexandria, New South Wales, 2007. 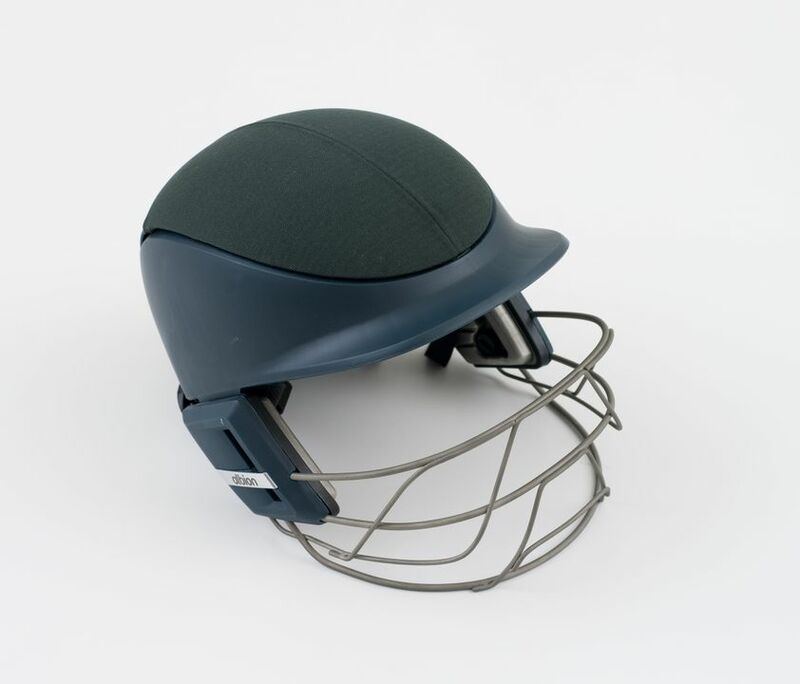 Protective cricket helmet with green plastic (polypropylene) and fabric shell with visor. The helmet has a grey titanium wire face guard and a black chin strap. Maker's name and logo on back and sides of helmet. Helmet designed by Design + Industry and Albion Hat and Cap Co Pty Ltd, 2007. The helmet was made by Albion Hat and Cap Co Pty Ltd, Alexandria, New South Wales, Australia in 2007. This helmet has an articulated shell which adjusts to the shape of the head to provide a personalised fit. The unique head adjustment mechanism draws the rear shells together for a superior fit and retention. The mechanism is operated from inside the helmet with a tuning key. The same key is used to adjust the position of the grille. If the key is lost a coin can be used. The face grille is made from titanium wire for weight reduction and enhanced strength. The design has been refined to follow the contours of the jaw line, reducing the overall size and thus allowing greater head movement, which improves player stance and line of sight. The grille adjustment fasteners are located internally for safety and aesthetics, creating a streamlined dynamic look. The ventilation system is incorporated into the mechanical assembly to increase the airflow. The fabric-covered front branding panel provides for the air intake directly on the player's forehead, drawing in cool air in from the front and exhausting the hot air out the back. 'Cooltech' comfort pads allow the players to adjust the padding to get an exact fit. Super absorbent frontal pads made from 'Quick Wik' towelling draw the moisture away from the player's forehead so players stay dry during play. This helmet was displayed in the 2008 Australian International Design Awards exhibition at the Powerhouse Museum from July 2008 - July 2009. The Albion NXT cricket helmet received an Australian International Design Award and the Powerhouse Museum Selection in 2008. In 2008 the AIDA received 159 entries. The judging panel recommended 60 of these products as finalists and of these, 18 products for an Australian International Design Award. The products receiving the Australian International Design Award were announced at a gala dinner and awards ceremony on 30th May at the Australian Technology Park, Redfern. In 2008 the Australian Design Awards program was opened up to internationally designed products on the market in Australia, and became known as the Australian International Design Awards.